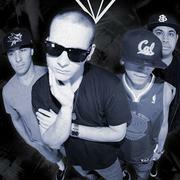 The Holdup is a San Jose quartet with a unique sound that incorporates elements of Hip-Hop, Indie, Reggae and Pop. The group formed in early 2008 when drummer Danny Flores and vocalist Mike Garmany recruited bassist Kyle Christensen and DJ/Manager Clev Stiles. After only just a few months of playing local gigs the group cultivated a solid fan base and began selling out local venues. As the group’s popularity grew the demand for an album was apparent. In late 2008 The Holdup hit the studio and began recording their first full length album Stay Gold. In March 2009, Stay Gold was ready for release and debuted at an astounding #34 on the Top 100 Reggae Albums on iTunes. The album was soon featured on the iTunes “What’s Hot” list for six weeks and CD Baby’s Top Reggae Albums as a result of the release’s outstanding success. Their single Good Times also received significant notoriety from local radio stations including Santa Clara University’s KSCU 103.3FM and KITS Live 105.3FM, the Bay Area’s alternative rock station. The widespread success of Stay Gold prompted their follow-up album Confidence in 2010. Their sophomore album had a sound of its own, including the summer time vibes of “Summertime Baby” and the heartfelt lyrics of “Motion,” adding a musical diversity to the 11 track release. Much like their first album, Confidence found near instant success and rose to #1 on the iTunes Reggae Chart and earned The Holdup iTunes Best New Reggae Artist of 2010. Their popularity only grew with their cover of Peter Bjorn and John’s “Young Folks” which The Holdup renamed “Young Fools.” The song was quickly picked up by the popular San Francisco radio station KITS Live 103.5FM. The increased circulation of the track on the airwaves only further contributed to their expanding fan base. Just prior to the drop of their third album, iTunes once more recognized the groups talent by placing their track “Summertime Baby” on the iTunes Essential Rising Stars: Reggae playlist, which debuted on March 28, 2011. Still Gold was launched on April 26th, 2011 and followed in the path of the previous two albums, achieving success quite early on. iTunes debuted the album at #1 on the Reggae Charts and Billboard ranked it #2 on their Reggae Album’s Chart. Shortly after the release of Still Gold the group landed a full catalog publishing deal with New York based publishing company Songs Publishing home of such acts as (Dirty Heads, Sleigh Bells, Bright Eyes, Minus The Bear etc). Throughout their career so far, The Holdup have played with some of the biggest names in the industry such as Rebelution, Pepper, The Dirty Heads, Sublime with Rome, Bone Thugs and Harmony, Warren G, Silversun Pickups, Panic at the Disco, Dev, Afroman, and more. The Holdup is currently finishing their fourth album Consequence, set to release in Spring 2012 with their single “My Weekend” scheduled to world premier on the Menace Morning Show on Live 105.3FM. The San Jose natives have only been getting bigger and hope that the release of Consequence will continue the developing trend.